In 1912 George David Silva - variously described as Cingalese, Indian, 'Eurasian’ and a Queenslander - was living in the central coast town of Mackay working as a farm labourer. He was a convert to the Salvation Army and this seemingly pious man, 28 years old, was described in one newspaper as being a peculiar ‘pet’ of the church. Silva's religious zeal was such that he led meetings at Mackay with robust volleys of ‘Glory Hallelujahs’ and testified in the style of a bible-bashing preacher. Despite all this, Silva committed one of the most brutal crimes in Queensland history. The act was discovered one day in November 1911 when his boss, Charlie Ching, returned home to find his house locked up and his family absent. Silva was standing outside the house and claimed they were all out visiting a neighbour. Ching waited around but after a while he climbed in through a window and found a truly horrible scene. The bodies of his wife and three of the children lay dead on the floor, in a neat row with a bed sheet spread over them and a Bible carefully placed on top. His wife and eldest child Maud had been shot with a gun, and the younger children’s heads had been smashed with a blunt object. The house was a gruesome mess. The two other children, Eddie and Dollie, had been at school but did not return home that day. Their bodies were found in scrub the next day. One had been shot, and the other clubbed to death. Silva was arrested, charged and tried in Mackay for the murder of Maud. During the trial it was claimed that he wanted to marry her, but she had constantly rejected his advances. It was alleged that it was this rejection that sparked Silva’s bloody carnage. 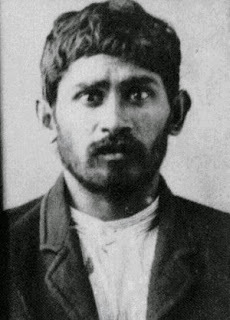 The ritualistic use of the sheet and Bible at the murder scene had incriminated Silva and he was condemned to hang at Boggo Road, in Brisbane. At first the witnesses thought that he was a religious maniac, but as his diatribe went on it seemed more like an exercise in buying time and attention. He reeled off more Psalms and more quotes from the Bible, then continued to lecture his audience with preaching of the ‘narrow path to salvation’, reciting the passage regarding ‘walking through the valley of the shadow of death’ more than 12 times. This aroused scorn, as witnesses shuffled and whispered about his brutal crime. He then raised a scream hoping the other prisoners would hear his voice. He told them to be warned and cease their evil ways. As the time approached half-past eight the officials became uneasy. The under-sheriff climbed the stairs and indicated that the time was up. Silva started on the Lord’s Prayer yet again, this time accompanied by Major Wilson from the Salvation Army. As they finished, the hangman stepped up and pulled the white hood over Silva’s head before quickly adjusting the noose. The under-sheriff quickly gave the signal, the lever was pushed, and Silva was finally silenced. He had jusy delivered the longest gallows speech in Queensland (and perhaps Australian) history.